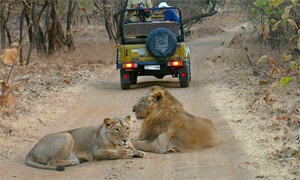 Gir Jungle Trail is a 3 hours ride into the Gir national park by an open Jeep. This is an opportunity to observe the wildlife animals in their natural habitat. Safari timings are 6 to 9 AM, 9 to 12 noon, and 3 to 6 PM. In the Shiva Purana and the Nandi Upapurana, Lord Shiva is quoted as saying, 'I am omnipresent, but I am especially in twelve forms and places.' 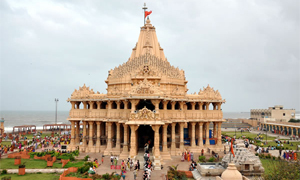 These places are known as jyotirlingas, and Somnath is the first to be found in the world. Around the linga the moon god Soma built a mythical temple of gold as an ode to Lord Shiva's glory and compassion. 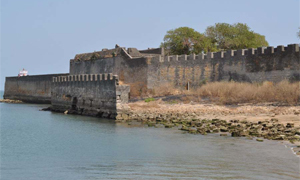 This tiny island linked by a bridge to Gujarat’s southern coast is infused with Portuguese history; its major architectural landmarks include three churches and a seafront fort; the streets of the main town are remarkably clean and quiet once you get off the tourist-packed waterfront strip; and alcohol is legal here. One must visit Devalia park too where lion sightseeing is guaranteed. This is a 16 sq km fenced area with the big wild life kept in. Lions, leopards, deer, blue bulls and other animals can be seen here. The park remains closed on Wednesday.